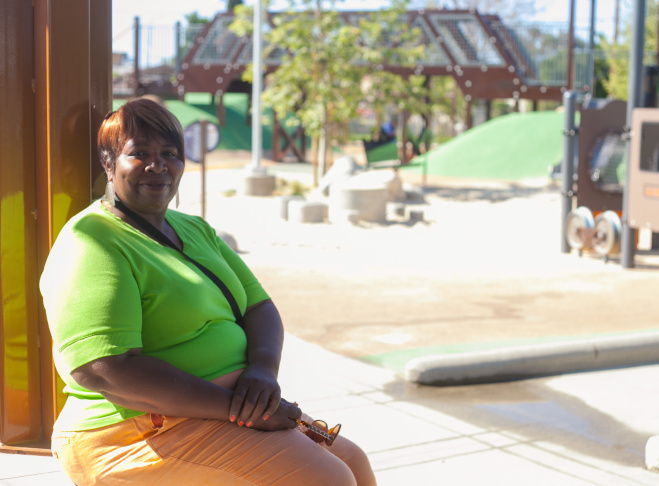 Lottie Cleveland at the newly completed Serenity Park in Watts on Monday, April 6, 2015. 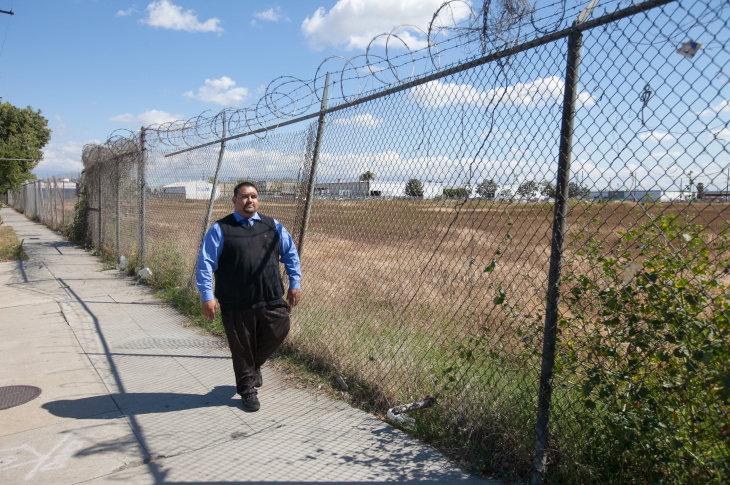 Andres Ramirez, community liaison for Community Health Councils Inc., walks along the vacant lot that used to be the South Los Angeles Farm, on Monday, April 6, 2015. A vacant lot that used to house a gas station on 86th and Broadway street in Watts on Monday, April 6, 2015. Local artists helped design the newly completed Serenity Park in Watts that includes exercise equipment, walking path and innovative playground equipment. 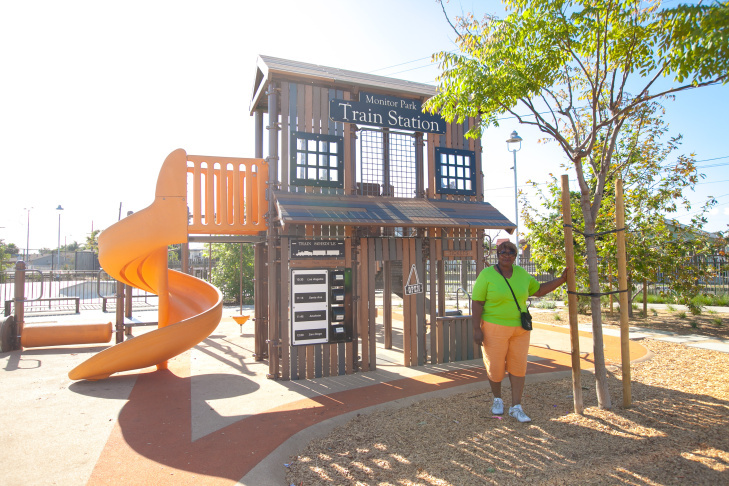 Lottie Cleveland stops at the newly completed Serenity Park in Watts on Monday, April 6, 2015. 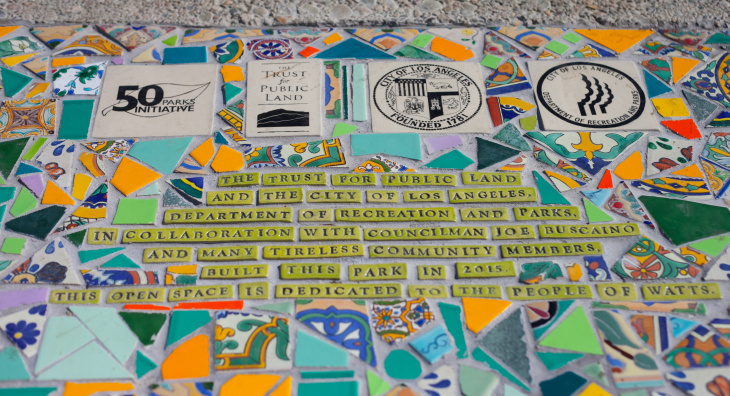 Local artists helped in the design of the newly completed Serenity Park in Watts. The park includes exercise equipment, walking path and innovative playground equipment. 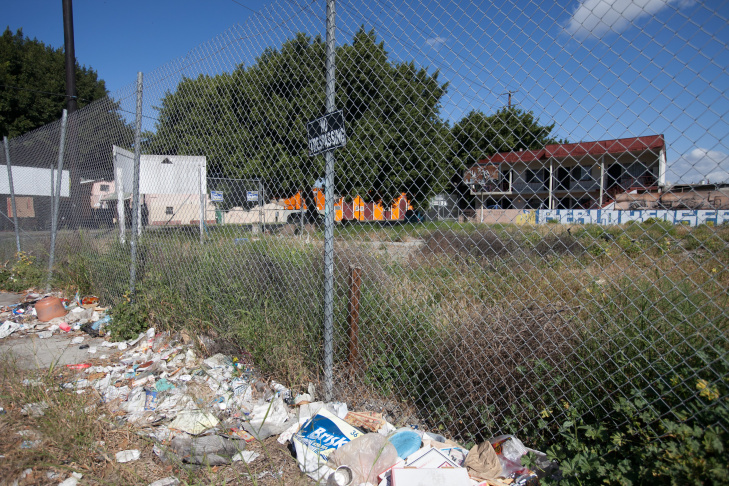 For decades, an odd-shaped lot on King Boulevard in South Los Angeles sat vacant. Though fenced off from trespassers, trash collected inside its borders and the weeds grew brown and brittle. The property is one of thousands of parcels landowners have abandoned or left vacant, some in the wake of the Watt riots of summer 1965, which community organizers now want to turn into play spaces for young children and their families. Organizers like Lottie Cleveland and Andres Ramirez share a vision to acquire the lots and transform bleak stretches in impoverished areas into community spaces where kids and their parents can enjoy the outdoors. "When you walk past or drive by a place and it looks so ugly and dried out and dirty and trashy, it just seems to block your view," Cleveland said. She and Ramirez met up recently at location of one of their successes: Serenity Park located next to railway tracks in Watts, where moms and dads can exercise on outdoor fitness equipment while their children enjoy state-of-the-art play structures. "And when they planted trees here and put this park here and grass, it allowed you to breathe. It like uplifted the community," said Cleveland. Cleveland and Ramirez want to see a similar metamorphosis at the King Boulevard lot. Last December, organizers turned it into a pop-up soccer field, with a concert stage in one corner and a kiddy play area in another. Just last week on April 25, a lot on Central Avenue in South Los Angeles was “activated” into a cultural fair, complete with art installations, a storytelling zone, and a stage for performances. These day-long takeovers have been a hit with local residents, and fired up a growing movement to reclaim vacant lots for community betterment. Ramirez, now 33, grew up in South Los Angeles and remembers he had few outdoor recreation options. He recalls playing in trash-filled lots “because it was all that was available to us,” he said. Today, he is an organizer with the local group Community Health Council that is working to make over the lots into productive community spaces. The group created a map showing all of the vacant and abandoned lots citywide, including who owns them and whether they are in process of being developed for community use. 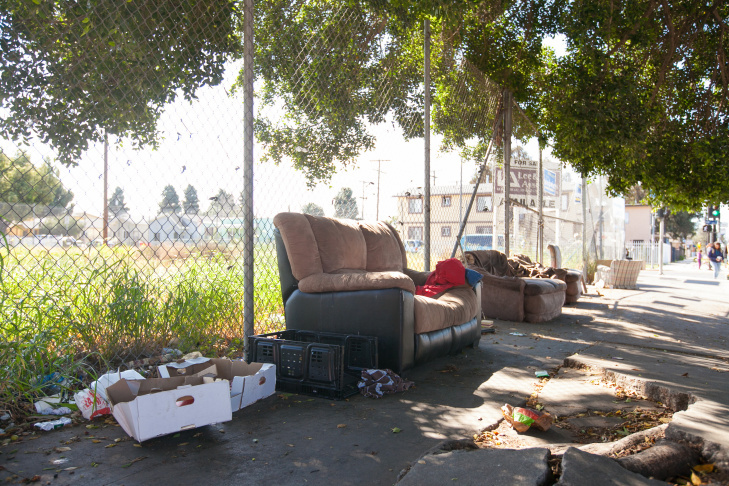 Almost 3,000 lots sit vacant in South Los Angeles. In comparison, West L.A. has 134 vacant lots and the Wilshire Miracle Mile district has 310 vacant lots, according to Ramirez' group. “The further south we go, the more overgrown and the longer they’ve been abandoned,” Ramirez said as he drives through South Los Angeles. “We’re getting closer to Watts. A lot of these lots were made vacant during the uprisings of '65, places that were burned down and just weren’t rebuilt,” he said. 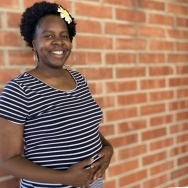 Tori Kjer manages projects for The Trust for Public Land, the land conservation nonprofit that Watts residents sought out to help tackle the lack of park space in their communities. “In an ideal world, everyone would have a park within a 10-minute walk of their home,” Kjer said. Working with the community, Kjer and her team identified a suitable vacant plot and tracked down the owner. They got the plot appraised, wrote a state grant and bought the land for $875,000. 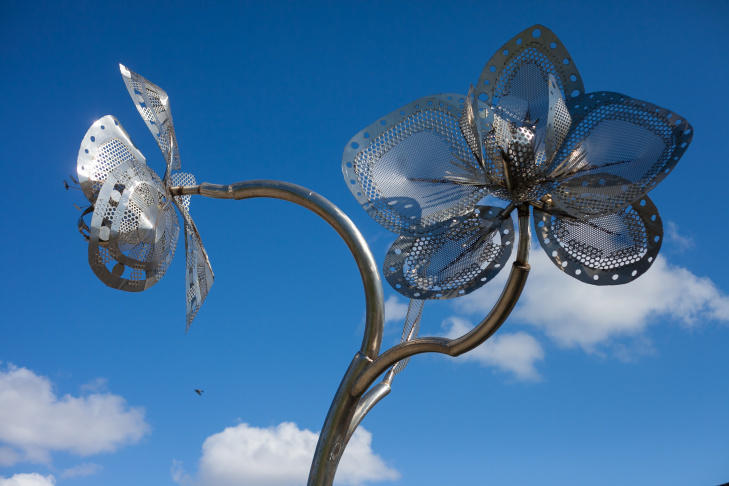 Six years, and almost $5 million later, the blighted lot was transformed into Serenity Park. “The main benefit we see to bringing new parks to dense communities like Watts is having parks that are walking distance from people's homes,” Kjer said. On one recent Thursday morning, Melody Culpepper and her two toddlers were out enjoying Serenity Park, squeezing the marrow out of the playground's offerings. Culpepper lives in the Nickerson Gardens, a sprawling public housing complex nearby. “From our side of the community, from like Compton Avenue and Central, this is the nicest thing we have,” she said. Culpepper said she visits Serenity Park every single day. She works out on the fitness equipment while her children, Cashmere, 3, and Haley, 1, bounce between the swings and the sand pits. It’s a gated park and small enough that Culpepper can see her kids playing as she exercises. “I even tell my friends, I’m not going to 24 Hour Fitness. I’m not going to Bally’s. I’m going to the park in the neighborhood. It's absolutely free and the kids can play closed in,” she said. Culpepper believes the park saves her and her kids from going crazy, cooped up in her tiny apartment. 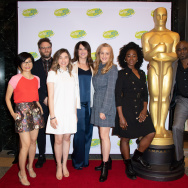 “It’s like, when you at home with little kids, it's a lot — it's a whole lot,” she said. A growing body of scientific literature suggests there are negative impacts on children's development when they aren't exposed to the outdoors. Researcher and writer Richard Louv calls the effects a “nature deficit disorder.” He points out this is not a medically recognized ailment, but his analysis of the evidence, cataloged in his book "Last Child in the Woods," shows small children are dramatically disadvantaged when they don’t have outdoor play. Louv said the literature finds an “impact on ADD, on obesity, on creativity, on the ability to learn, on cognitive functioning, on mental health in particular” in children who did not have regular outdoor play. He has called for all children to have dedicated outdoor time, even in densely urban settings. “I think children, no matter where they live, have a human right to the positive benefits of experiences in nature,” Louv said. Those benefits, he said, include a healthier immune system from playing in – and ostensibly ingesting – dirt. There has even been research that shows bacteria or infectious diseases, commonly shared between toddlers and preschoolers, are lessened when children are outdoors more. Playing outdoors generally means children are more physically active. The Centers for Disease Control and Prevention recommends 90 to 120 minutes of moderate to vigorous-intensity physical activity for preschoolers during their typical eight-hour day in child care. 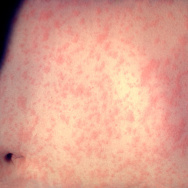 The American Association of Pediatrics promotes this CDC guideline and preschools are expected to follow. But in South Los Angeles, few children attend preschool or child care, which means many children under 5 hang out at home given the dearth of parks. It may not be just their health that is impacted when children don’t have outdoor play. Kelly Decker, former executive director of the Children’s Nature Institute, believes early education for children must include significant time outdoors. “Nature provides all kinds of materials that are not uniform in size which fires up different parts of the brain,” she said. Decker said unstructured time in nature can help children learn much more than what they get in class. Take basic color recognition. “The natural world isn’t really a primary colored world,” Decker said, citing the infinite shades of brown or green a child might encounter. Two decades ago, Decker said, parents didn’t question the need to send a child outside to play, and run out their excess energy. “We know now that it’s much more than blowing off steam. It’s absolutely crucial for development because we know now that the children who are not getting those experiences are not doing as well and are not as ready for school,” she said. “Having outdoor experiences is on par with having food, water, shelter and safety,” Decker said. This story is part of a collaboration investigating social change in South L.A. 50 years after the Watts Riots. The project is coordinated by USC Annenberg.